Favored, Fabulous, & Fly Boutique invites you to attend Clutches & Pearls Dinner! A casual meet-up for Confident Women who enjoy delicious food, great conversation, and an opportunity to connect with other positive goal-getting women! • You’ve been longing for a night to  up and simply celebrate YOURSELF, right? • You’ve been desiring to expand your circle beyond your Fav 5, right? 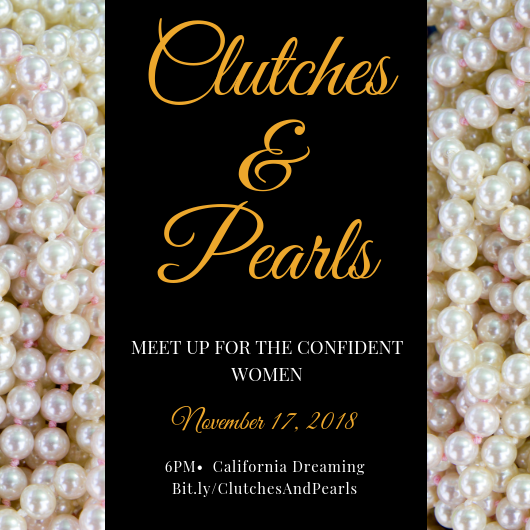 Come and enjoy yourself at Clutches & Pearls Dinner on November 17, 2018 at 6pm in the lovely city of Charleston, SC. So…who should attend this event? ANY woman that desires to dine, laugh, talk, build her confidence and simply enjoy herself! Dress up, look super cute…and don’t forget to carry your clutch and wear your pearls. Come camera ready…because you are sure to snap a selfie or two throughout the night. Oh yes, and please come ready to win a few PRIZES and even an opportunity to score a chic Curvy & Confident Swag Bag! **Average Meal Cost: $30 - $40 depending on menu selection. **Reserve your seat today to be entered into a special Swag Bag drawing. Thank you for accepting my invitation; and I look forward to enjoying a fun dinner party with you! Providing quality fashions and boosting your confidence in the process!